Once there was a small Indian child that was separated from his parents while searching for food in the wilderness. A mighty eagle with its powerful eyes spotted the lost child from its lofty perch atop a distant mountain. This magnificent bird swooped down taking the infant to its nest where it fed and cared for the child. The child soon grew in stature and became wise to the ways of survival. His eyes grew strong and far off he could see a people much like himself. As he watched he realized they didn’t understand the ways of survival and would soon die. After deciding to help them, he went to them and taught them how to hunt and fish. His parents, recognizing the necklace round his neck, rejoiced at his return. The boy, however, found he was different from them. As his eagle parents would fly overhead and call for his return, he longed to be with them. The Gods heard the boy’s prayers and because of the great deed of saving his people, granted him his desire. The boy was transformed into an eagle, the most majestic of all the god’s creations. Much the same way, we too can experience a transformation in our lives. As the student studies and obtains knowledge, he transforms from a state of darkness to a state of wisdom and light. The athlete transformed his body from weakness to strength. The carnal man transformed his soul from the ways of the flesh to that of the spirit. 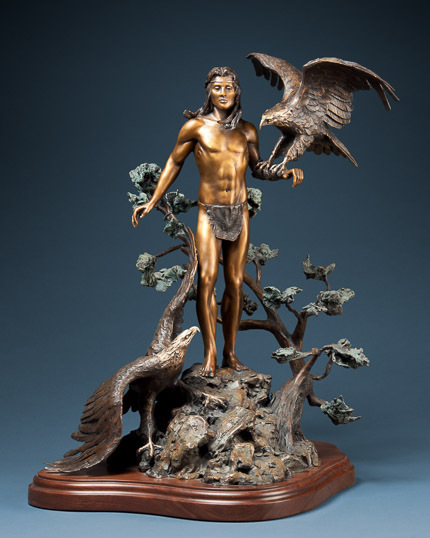 These sculptures, “Eagle Boy” and “Transformation,” depict for us this unique story and remind us of the transformation that can take place in our lives according to our desires and works. We can overcome. We can achieve. We can transform from one sphere to another.